This is an old, but very effective trick for miking kick drums. 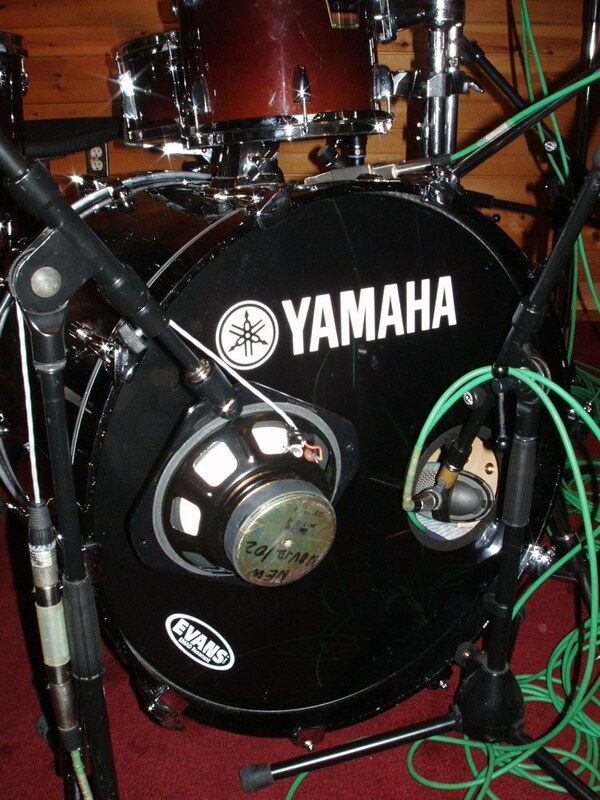 Take a Yamaha NS10 speaker cone and use that to capture the extra low frequencies of the drum. Without going into too much theory about this, a dynamic microphone and a speaker are essentially the same thing, they are both transducers. They take acoustical energy and convert it into electrical energy or vice versa. So what you do is take the speaker out of the box, solder a male XLR plug on a short cable to the speaker terminals. Pin 2 goes to (+) and Pin 1 goes to (-) pin 3 is not used. The matter of mounting this speaker to a stand is a different matter, this is the main reason to go buy the Yamaha Subkick microphone, because of it’s great, easy to use mounting system, that and its also more durable likely than the home version. One way to do it is to take a standard mic clip apart and fitting the slotted part securely to the corner mounting holes of the speaker, that is if the speaker you are using has the 4 corners and not just holes drilled just around the cone [square not a circle]. Or you can attach it to a microphone boom or goose-neck permanently. 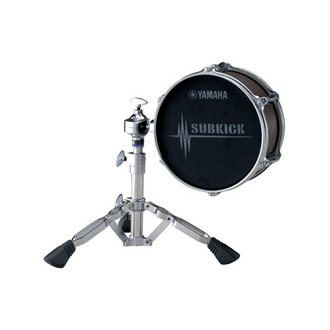 The output of the subkick is very hot, meaning you are going to have to attenuate the signal for it to be of any use to you. An inline -20dB pad, a pad at the mic pre, or one built into the mic will need to be used. This guy used a 10k Ohm in series with pin 2 and a 1k Ohm resister across pins 1 and 2 to drop the output about 20dB. Mic placement: These work really well at the edge of the drum parallel to the skin. Try it under a floor tom too. Why the NS10? Most time you see these in a studio it will be with an NS10 cone, but why? From what I’ve been told it is because there are usually extra NS10s lying around a studio, all studios had NS10s, you could predict how it would sound, and they have a frequency response that works well. Don’t know how much truth there is to that. You can use any speaker you want, it will obviously make a difference in the sound. Finally, here is a picture I took of one of the two diy subkicks at Metalworks Studios. Note mounting, placement, and inline pad. Please do, keep in mind any speaker will work for this. NS-10 speakers are what many studios have spares of so that’s what got used. I’ve seen lots of people using all kinds of speakers, some don’t even take them out of the cabinet. You should actually use pins 2 (+) and pin 3 (-) and leave the shield disconnected at the woofer, but connected at the xlr. this will properly shield the mic signal to the mic pre and keep the signal balanced. in a dynamic microphone that is how it is wired, only the housing of the microphone is grounded to avoid rf interference. since there is housing on a woofer, it is not required. but you do want to keep the signal balanced and shielded. Connect XLR’s pin 2 to (+), pin 3 to (-), and pin 1 (shield) to loudspeaker’s frame and central part. Even low impedance 8 ohm coil must be possibly shielded to reduce hum and EMI/RFI. I can’t wait to try this. So after the speaker is connected to the xlr cable, I can just use my preamp on the M-Box then right? Pretty much, it’s not going to sound great on its own. It works best when mixed with a more ‘full range’ mic. Ok i see. That makes a lot sense to mix it in. I might try it on a bass amp but also with another mic or DI. This is a great way to make the most out of what you got. I heard somewhere that the beatles recorded the bass sound for “rain” with a speaker as a microphone, just like this sub-kick. This is an interesting way to do it the Yamaha is quite costly so an economical alternative is useful for people on a budget and can get similar results. @masonboisvert I have 2 articles on it – http://t.co/t0XkkHYR and http://t.co/svALadhT Happy to answer any specific questions. Thanks for this write up! I just salvaged an old 10″ tom, bought an in wall speaker at radio shack for 40 bucks that had the PERFECT 6.5″ woofer in it, 6 bucks in hardware at the hardware store, and wired this sucker up. Your 1k and 10k resistor values work PERFECTLY. I finished this for about 112 bones with 6 in hardware, 16 in mesh heads, 50 in random old used stand parts at the local music store, and 40 for the speaker. Everything else I had laying around. That being said, to buy the parts for the tom I used would seriously add up, it’s an acrylic custom tom with trick lugs and die cast rims. I may have the most over engineered subkick in the history of subkicks, but it looks sweet! I had a question, can you use RCA jack instead of XLR? PLEASE let me know if any one has tried this, and your results. You should use either XLR to connect to a preamp or 1/4″ TS jack to connect to DI box + preamp. RCA connections are usually for line level, meaning no amplification is required. This needs a preamp to get to line level.